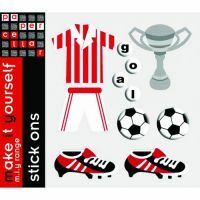 Football themed, self adhesive stick on embellishments which are acid free. Use them in card making and scrapbooking for boys, men and female football fans. The set includes seven separate stickers plus the letters to spell the word goal.